Attention: The filing window for low power FM applications is CLOSED as of November 15th, 2013. It is unlikely that the FCC will be making another opportunity to apply for low power FM licenses any time soon. See below for archived webinars, or for next steps and more ideas, visit prometheusradio.org/nextsteps and subscribe to our newsletter. Thanks for your support, and good luck! Ready to apply for a community radio station? Join Prometheus Radio Project’s Program Director Ian Smith and Policy Director Sanjay Jolly as they explain the new FCC application form for low power FM radio. Prometheus staff will also talk about using the FCC website, meeting eligibility criteria, finding a frequency, avoiding errors, and more. Ready to apply for a community radio station? Join Prometheus technical team as we explain the new FCC application form for low power FM radio. Applications are due during a two-week window from Oct 15-29. This webinar will provide some relevant background information and explain the technical section of the LPFM application--Form 318, Section VI, LPFM Engineering, Tech Box. This presentation explains the technical aspects you will need to understand in order to prepare your application. Many new stations need financial support to get going. In this webinar we’ll review some strategies for grassroots fundraising. Laurene Francois, Training Director at the Grassroots Institute for Fundraising Training will discuss fundraising principles, strategies, and methods for smaller organizations, as well as ways to create sustainable funding programs that fit your station. ¿Estas listo para someter tu aplicacion para una licencia de radio potencia? Te invitamos a participar en el webinar dirigido por Ana Martina y Scott Pinkelman en donde explicaran como llenar la forma 318 para aplicar a frecuencias de baja potencia (LPFM por sus siglas en ingles). Hablaremos de como utilizar y crear una cuenta en la base de datos de la FCC (CDBS), de los requerimientos de elegibilidad, como encontrar una frecuencia, como evitar errores y mucho mas, acompañanos!! Locally produced news, arts, and culture reporting can foster strong community-led movements for more critical, accountable, and representative media. Join our guest speakers as they discuss how they have worked to build volunteer news departments that strive to prioritize and promote the voices of marginalized people, focusing on local events and groups. Our presenters will also share documents and trainings they have designed and implemented to strengthen spoken word programming at their stations. In this webinar presenters will share their experiences using free software to work with community radio, and discuss how open source software can help your radio station communicate and operate. We will discuss media players, audio editing software, automation, and other programs. The presenters will also discuss the importance of free software to community media. Have questions about your LPFM application? 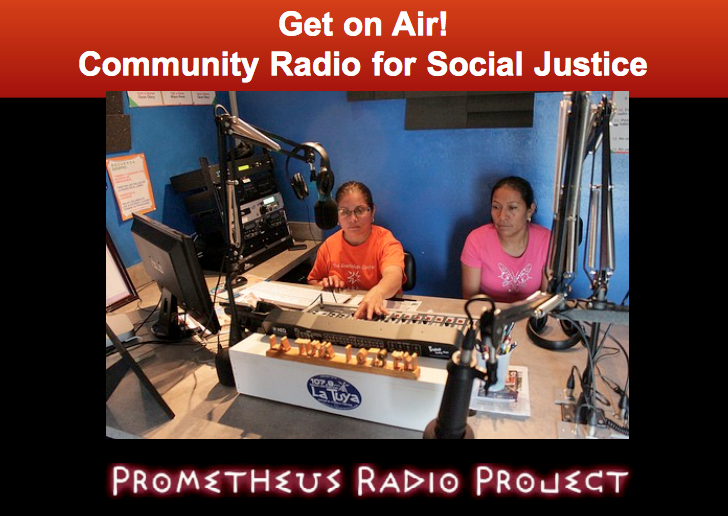 Learn more about the LPFM guide developed by Prometheus and Free Press, which covers the ins and outs of starting a community radio station. Following the presentation a question and answer session addressed comments and concerns about FCC LPFM applications. Not just for gear heads, this training will give you what you need to know to set up your broadcast and production studio! Our knowledgeable presenters will discuss the ingredients for a studio: what you need and how to use these pieces of equipment, how they work together, and where to source them. This training will deliver the information you need to know about being on air. Our presenters will outline the rules and regulations of broadcasting, how to develop and manage programming at your station, what licenses and legal issues there are to playing copyrighted music, as well as how to find and play free music. There will be a questions and answer session at the end of the webinar. It can be daunting for new stations to produce 24/7 programming. In this training, Andrew Stelzer and Andalusia Knoll shared sources of content that you can use to augment local programming, offer news in multiple languages, and provide diverse perspectives. This training also highlighted the opportunities to distribute your content to stations across both the country and the world. Low Power FM radio stations are an important medium to empower participatory community voices and movements for social change. In this training there was a review of democratic station governance models and a look at some resources for creating these structures and the policies that support them. One of the best ways Low Power radio applicants can prepare to apply is to begin looking for viable transmitter sites. (The transmitter site is where the transmitter and antenna live, and it may or may not be at the same location as the studio.) There are a lot of things to consider when finding sites, from terrain to FCC regulations to local ordinances. In this training, Prometheus staffers Will Floyd and Ana Martina reviewed strategies for finding and evaluating potential sites. Community media making means the participation and support of a broad base of participants. To create a participatory community radio station requires considering who who might not already be represented in the media and building relationships that make your station a place for diverse content and supporting communities and movements. Our guest speakers will discuss different outreach tools including a community needs assessment and other strategies. Speakers will discuss what it takes to build relationships among multiple communities that will strengthen and build a community radio station. Prometheus helped PCUN build their radio station in 2006. KPCN, 95.9 FM - Movement Radio - "The Voice of the People," is used to organize workers, register voters, support statewide and national campaigns for immigration reform, and amplify LGBTQ voices and issues. This webinar explains the opportunity to start a community radio station, the process to apply, and the experiences and benefits of community radio for the LGBTQ community. Learn some DIY ways you can create an online presence for your radio station or media project. Presenters will talk about using free blog sites like Wordpress and Tumblr, social media, podacsting, and newsletters. Ready to apply for a community radio station? Join Prometheus staff as we explain the new FCC application form for low power FM radio. Applications are due during a two-week window from Oct 15-29, but there is a lot to do before then. The good news is that you can start to complete your application now. We'll talk about using the FCC website, meeting eligibility criteria, finding a frequency, avoiding errors, and more. RFree will provide free and open source tools for radio frequency engineering. The basic tool in RFree will be a channel search in which the user gives a location and the software returns a list of all possible channels, with a designation of which channels are available and basic information about why a given channel does or doesn't meet the FCC's requirements. The user will be able to see what channels are clearly available at a location, what frequencies may be available with an engineering waiver, and what nearby locations may have more channels available. The channel search will also display a map indicating the expected coverage area of the proposed low power station. The more advanced tools, which will be designed primarily for use by engineers, will include the ability to explore the channels that may be available with an engineering exhibit. Learn about the many different goverance structures that exist for setting up a community radio station. We'll go over the role of radio station boards, station managers, chief engineers, programming committees, advisory councils and more. Presenters will also discuss various staffing and volunteer management configurations that you could implement at your station. The currently available tools for low power FM channel searches include freely available online tools as well as stand-alone software. The premier online channel search tool is the "LPFM Channel Search" provided by REC Networks. The LPFM channel search is an excellent tool for completing a "first pass" search to find channels that easily meet the FCC's requirements. With the LPFM application window approaching in the next year, many groups who are considering applying are looking for ways to pay for equipment and engineering work. In this workshop, we'll examine the costs of associated with building a station and how to apply effective grassroots fundraising strategies to community engagement, publicity, and event planning. Sabrina Roach, from Brown Paper tickets, will be a guest presenter and impart wisdom gained from her work doing development in community radio. We'll also talk about designing a fundraising plan, making a budget, and organizing a team to implement various fundraising methods. One of the best ways Low Power radio applicants can prepare to apply is to start to look for viable transmitter sites. (The transmitter site is where the transmitter and antenna live, and it may or may not be at the same location as the studio.) There are a lot of things to consider when finding sites, from terrain to FCC regulations to local ordinances. This webinar will cover strategies for finding and evaluating potential sites. Social networks have the ability to reach millions of new supporters across the US. For this reason, community radio stations have the potential to use this tool to expand their listening base, gain support from the community, announce events, post shows, fundraise, and more. This workshop will teach participants how to use tools such as social networks, online videos, podcasts, blogs, and other new media to effectively launch a variety of social media for their stations/groups and maximize their reach in the community. Community radio friends chat live with Prometheus staff about all things community radio in this Q/A session. Staff members Jeff Rousset and Vanessa Maria Graber answer questions about the community radio application process and other aspects involved with building a station. They also present some radio news, take questions from the audience, and have discussions about radio policy, operations, and community building. October 2011 "How to Find Viable Transmitter Sites" Presented in October, 2011 by Maggie Avener: Download the PDF here. For the version with Audio voice-over, click here.